Marcelle Narbonne died on 1st January 2012, aged 113 years 282 days, the 8th oldest listed person in the world, and the 8th oldest French person ever. Following the recent death of 113 year old Mathilde Aussant, ‘doyenne des Français’, (oldest lady in France), her successor to the title, Marcelle Narbonne lives in Les capucines retirement home in Argeles-sur-Mer. 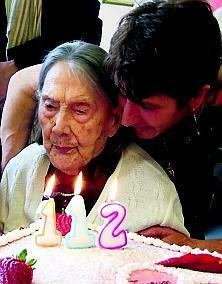 Born in 1898, her life has spanned three centuries. She married in 1917 but divorced in 1922. She has no children. She loves chocolate, an occasional glass of champagne, music, poetry and according to her carers, she marvels at the fact that she is in such good health for her age. Although mostly confined to a wheel chair, she is able to walk with help, and joins the other residents for meals. Let’s hope that she continues to thrive on that wholesome Argèles sea air.